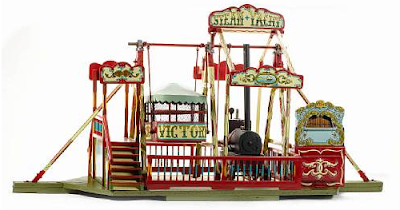 A scratch-built fairground "Steam Yacht" model, electrically operated automaton, late 20th Century. With small horizontal four-wheeled dummy steam engine with top pressure gauge and tall chimney, model of showman's organ beside and main yacht carriage supporting single ride pod with access stairs to side, balustrade edging and title pediment above, all profusely painted in the showman's taste in predominant tones of red, yellow and green, on stilled baseboard. My favorite part of the description... "all profusely painted in the showman's taste in predominant tones of red, yellow and green..." I believe I will tune my preferred color palette to align myself with the showman's taste.